“Has an LCD screen, walking foot, and quilting foot." Beginners and veterans alike say the computerized Brother cs6000i is a sewing machine that can satisfy almost everyone. For the money, it offers a lot more features than other beginner-compatible machines, including an LCD screen, an impressive 60 stitches and nine presser feet, including a walking foot and quilting foot more often seen on pricier machines. Owners love the easy-to-use convenience of the Brother cs6000i, which they say makes it ideal for amateurs who want to focus more on their fabric than operating the machine. 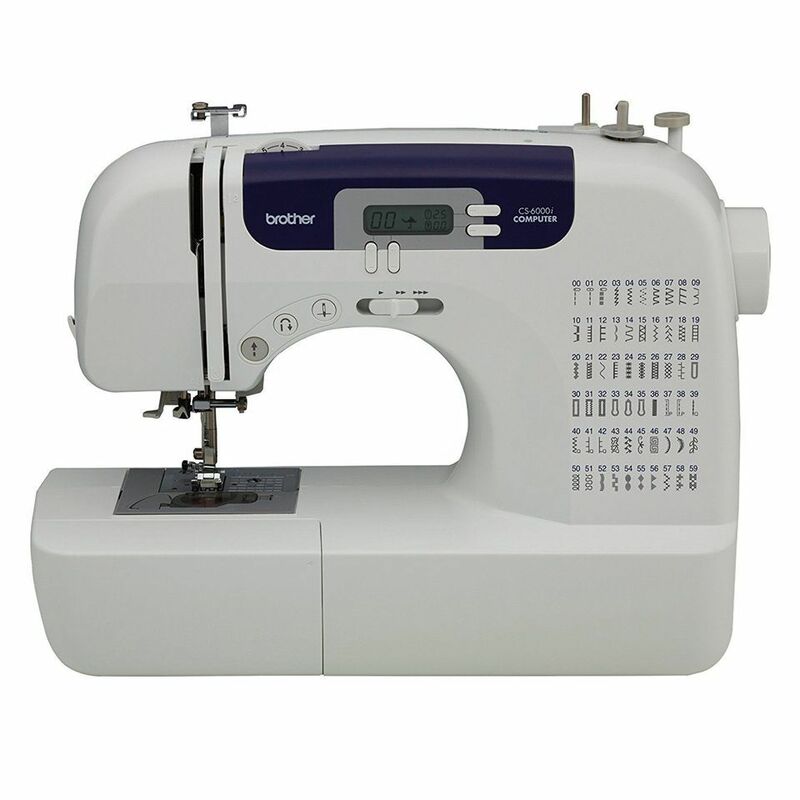 There is a push-button stitch selector, a sewing-speed glider control, threading diagram and an automatic needle threader. There is also an extra-wide sewing table that can accommodate larger projects including blankets; seven button hole styles; and a hard-sided carrying case for increased portability. A number of beginners vouch for this Brother, saying the added features make it worth a small price premium compared with other basic models. A small group of reviewers warn of inconsistent thread tension, but the vast majority say beginners can’t go wrong with this Brother. Beginners who may have a little more experience and want to get a sewing machine that they can really grow into should check out the computerized Singer 7258, which blends a lot of easy-to-use features with advanced options including 100 stitches and six one-step buttonholes. It also comes with 10 presser feet – perfect for sewers who are gaining confidence and want to experiment with more complex projects. At its core, the Singer 7258 is still simple to use: It features a lot of no-fuss automatic settings including an automatic needle threader, automatic thread tension, automatic locking straight stitch, automatic reverse and automatic presser-foot pressure. There is also a top-loading bobbin system, a programmable needle that can stop up or down depending on the project, and an easy-to-use speed control that users love because it can help slow things way down for beginners. An introductory DVD is another nice touch. Users praise the smooth stitching and variety of options, but some give it subpar marks for its performance with thicker fabrics. Owners say the Brother XM2701 is just right for beginners, and most seem to think it hits a sweet spot in terms of features, price and ease of use. This mechanical sewing machine includes 27 built-in stitches, a one-step buttonhole and six presser feet, all of which give beginners a few more options without being too overwhelming. This compact Brother has several beginner-friendly features, including a dial-control stitch selector; a top-loading, automatic-winding bobbin; an automatic needle threader; and a free arm that makes cuffs, sleeves and other curved fabrics easier to handle. A hard case is available separately for anyone who wants to travel with the machine or add additional protection for storage. Users at all levels find this machine plenty capable for any lighter projects, and many say it is better than many lower-end models at handling thick fabric, too. It also comes with an instructional DVD, which reviewers say is especially handy in helping get up to speed. Buying a budget sewing machine doesn’t mean you have to settle for something poorly built. Affordable sewing machines are a great choice for beginners and experienced users alike. The Janome Graceful Gray Basic provides all the necessary features you will need with a build quality that is required to survive years of typical use. Beginners who want something that’s a little speedier and tougher than other inexpensive sewing machines will want to check out the Singer 4423, which can crank out an impressive 1,100 stitches per minute thanks to a stronger-than-usual motor. It features 23 built-in stitches and a one-step button hole, and includes four presser feet. Though this Singer is certainly capable of speed, it has plenty of musts for beginners including an automatic needle threader, top-loading bobbin and dial controls. There are also a couple of extras including adjustable thread length and a clear case for storage or travel. Users say it’s especially ideal for anyone who wants to work on thicker or more rugged fabric like upholstery, but they warn it may have more of a learning curve than other beginner-friendly machines. Singer has a Sewing Assistant app to help speed the learning process. Do you want something tiny but mighty for travel? Do you plan on introducing a child to sewing, but want a smaller-scale, more budget-friendly machine to do it? In both cases, the Singer 1304 might be the answer. This mechanical machine has just six built-in stitches, including one four-step buttonhole, and three included presser feet. This Singer has preset stitch length and width—a feature that might be too limiting for advanced sewers, but one that’s perfect for a true beginner who doesn’t want to get bogged down in too many settings. There is a simple-to-use dial stitch selector, an included threading diagram, a free arm and an automatic bobbin winder. 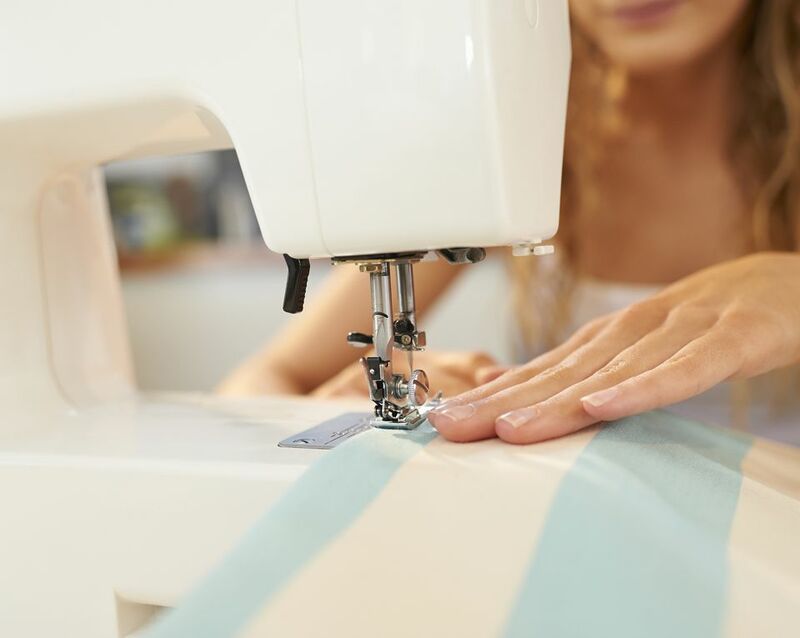 Buyers can even participate in a free online owner’s class that covers setup, operation and how to sew basics such as hems, buttons and zippers. A few reviewers say the bobbin can be hard to adjust and the thread jams too easily, but it comes highly recommended for anyone who wants a small, lightweight machine to learn sewing fundamentals. Want to take a look at some other options? See our guide to the best sewing machines.